Last Wednesday, fellow Essex Blogger 'LilliesandLove' and myself went to Kettners in Soho, London to attend the Dr Renaud beauty event where we learnt about the science and research behind the products and got to sample some of them too. All this coupled with a glass of champagne - I have definitely had worse Wednesdays! The range is available through Marks and Spencer or their website directly and they specialise in using natural ingredients which is great for anybody such as my blogging companion who have sensitive skin and find it hard to find products that not only benefit them but don't cause any irritation. Dr Renaud believed in nature being the best source for women to use in their beauty regime and not chemicals which is why the creams are kinder to skin. They specialise in keeping the skin hydrated which is what will keep it healthy - they also smell gorgeous too! You can find out more about the products and the brand at their website: www.doctor-renaud.co.uk or have a browse of the range the next time you pop into M&S. I recommend you do! The products feel great on the skin and although they feel thick they don't feel greasy. 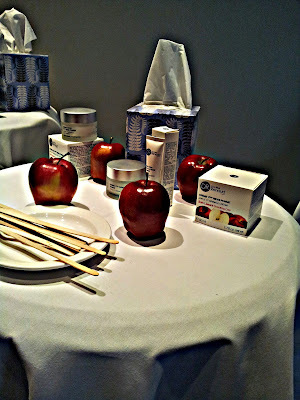 The fruity scent lasted for hours too - they have a home-facial treatment which I tried out on my hand to see how it felt, even after a journey home on two tubes and a train I could still smell the sweet apple scent! I wanted to eat my hand! I will be trying the products out over the next few weeks so will be able to let you know the results once I have given them a good trial but I do have high hopes for them based on the trial results and my sampling of the products. All in all I had a lovely afternoon. It is always nice to catch up with my fellow blogger chum and all the ladies at the event were friendly and welcoming too. 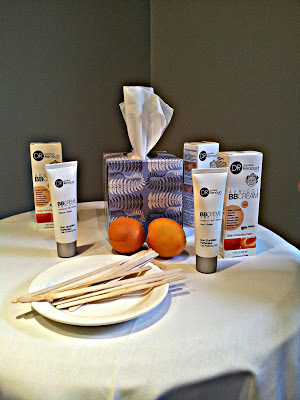 SAMPLING: I got to have a little pamper at the event, all in the aid of research! HARD AT WORK: More sampling!